We recently started stocking Lascaux Screen Printing Paste, which is a fantastic medium if you are looking for a 100% water-based screen printing system. Lascaux Screen Printing Paste is a high-quality product, enabling you to produce vibrant silk screen prints with acrylic paint! You can mix the Lascaux Screen Printing paste directly with acrylic colours such as, Matisse, Lascaux or Liquitex paints. The paste will slow down the drying time of the acrylic paint, making the clean-up much easier than compared to working with commercial screen printing ink. Also, when working with high quality acrylic paint, such as Matisse, Lascaux or Liquitex paints, you automatically have a high pigment load, which makes the process very cost effective. For this particular workshop he used adhesive vinyl as stencils. This method is great for people just starting with screen printing, as you can get interesting results without requiring a lot of equipment. There are however a few steps that need to be carefully considered for successfully producing a print edition. 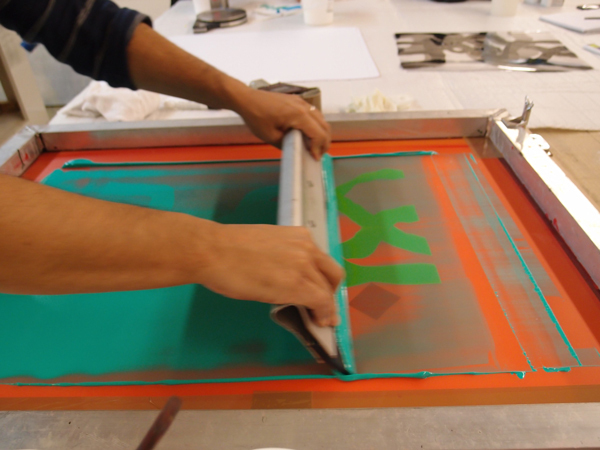 Before transferring the vinyl stencils onto the screens, the screens need to be coated with a light sensitive emulsion. Once coated, the adhesive vinyl can be applied. Next, the vinyl needs to be weighted down with piece of glass or Perspex, in order to press the stencil onto the screen and to prevent light from getting under it. This method makes sure that the stencil will completely block the light, creating the design you wish to print, while the areas on the screen that are left uncovered will chemically react to the light and harden. In order to achieve good results when printing on paper, it is important to work with a screen that has a fine mesh. Your screen needs to be stretched with at least a 77T mesh. The standard 43T mesh for textiles will not be suitable, as the weave is not tight enough and too much paint will get through, meaning you will lose detail. With the finer 77T mesh you will be able to achieve fine detail in your prints. Aluminium framed screens are particularly good for water-based paints, while wooden frames are more suited for working with solvent based inks. When it comes to selecting acrylic colours for printing, it is helpful to check first if the colour is opaque or transparent. For example, Matisse Mars Black is opaque, and Matisse Ivory black is semi-translucent. On the Matisse label you will find a small square which indicates the paint’s opacity. Lacscaux and Liquitex acrylics also have a similar indication system on their labels. When printing several layers on the same piece of paper, the opacity or transparency of your paint will determine how transparent or opaque each layer will look, influencing the end result of your printed artwork. In order to produce contrast between the different layers in the print, between transparency and opacity, and gloss and matte, you can also mix the paints with different Lascaux or Matisse acrylic mediums and gels. Once you are ready to mix your paints, there a few paint characteristics to consider. Unlike some of the other acrylic brands, Matisse acrylics come in two consistencies, “Structure”, which is a firmer and a more impasto style paint, and “Flow”, which is a runnier acrylic paint. According to Trent Walter, the thicker Matisse Structure is most suitable for smaller prints. However, it tends to become too thick once you work on a larger scale. For large-scale, water-based screen prints, Trent Walter suggests combining Matisse Structure and Flow to the consistency you require. It is essential to mix the paint thoroughly, as the paint has to be the same consistency all the way through. Adding the Lascaux Screen-printing Paste to your paint before printing will extend the open time of your acrylic paints and allow you to coat the screen evenly without the paint drying up too quickly. During his very informative workshop, Trent also pointed out that it is essential to weigh and note down each component of your paint mixtures. This will enable you to recreate your colours, should you wish to print editions. Remember that every print in an edition must be identical. Trent Walter is an artist and publisher based in Melbourne, Australia. His imprint, Negative Press, publishes limited edition prints and artists’ books by contemporary Australian artists.